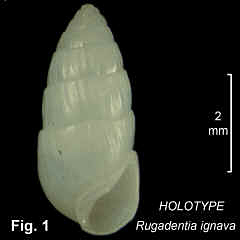 Description: Shell medium size, ovate, spire strongly convex, up to 6 teleoconch whorls. Protoconch infolded, type C. Teleoconch whorls rounded, turreted; spire whorls with axials folds from suture to suture, last whorl with axials fading out at periphery. Spiral sculpture absent. Aperture wide, relatively short, columella with weak plait; strong callus expanding onto parietal wall. Shell opaque white. Size: Up to 5 mm in length. Distribution: Endemic to Australia: Clarence River, NSW, southwards to Sydney, NSW. Habitat: Known from beach washup and from dredgings down to 33 m. Rare. Remarks: The holotype, shown in Fig. 1, has unusually weak axial folds and a very weak columella plait. The plait is generally weak in this species, but it is unusually weak in the holotype.. Fig. 1: Balmoral Beach, Middle Harbour, Sydney, NSW (C.029111 HOLOTYPE).